WILD magazine started in the 80s for pure hikers and conservationists. New owner Roland Handel gives us the lo-down on a fresh of this epic title. 1. WILD Australia magazine started in 1981, who was it for then? Founded in 1981, Wild Magazine has a long history as one of Australia’s premier outdoor magazines. Originally published as a quarterly, Wild’s focus during the 1908s was primarily geared toward Australian based bushwalking, ski touring, canoeing and climbing. Over time, Wild developed a following of readers interested in serious, committed and “Wilderness” style bushwalking. The magazine repositioned itself as “Australia’s Wilderness Adventure Magazine”, also extending to a bi-monthly format. In addition to the outdoors, Wild has and continues to support environmental and conservation issues, having been a strong supporter of the Franklin dam protests during the early 1980s. 2. How has the reader or direction of the magazine changed over time? Wild has always targeted outdoor enthusiasts and adventurers. When the magazine first started, way back in 1981, Wild was very much a bushwalking magazine. However, the magazine quickly attracted rock climbers, paddlers and back-country skiers. Over time, Wild became more focused on bushwalking and wilderness adventures. Those being multiday, serious adventures in which the bushwalker would be far from civilization for many days at a time. In more recent times, Wild have also written on environmental and conservation issues. With our most reiteration, Wild is returning to its roots, with a focus on outdoor adventure. In today’s modern age, many of our interests have changed, and hence we now include content on mountain bike riding, trail running, SUP and other more unusual activities (including canyoning, caving, slacklining). Wild will continue to develop and adjust to remain true to our heritage, but also to continue to attract the next generation of outdoor enthusiasts. 3. What is your vision for the magazine? What will you cover and who is it for? Wild are proud of our heritage and continue to consider hiking, bushwalking and conservation initiatives as core to our DNA. However, today's outdoor enthusiast is much more likely to undertake a range of outdoor pursuits, as well as activities that didn’t exist 30+ years ago (Mountain Biking, SUP, Trail Running etc). 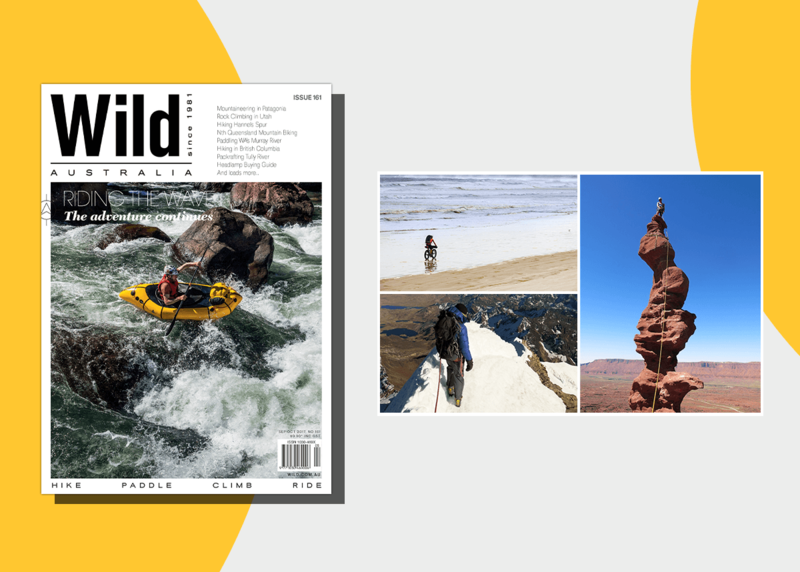 It’s ironic that Wild started out as a broader outdoor magazine, before specialising in Wilderness Adventure, to where we are now going, once more to broader outdoor activities. With this in mind, four pillars of adventure will underpin every each of Wild. These are Hiking, Paddling, Climbing and Mountain Biking. In addition, we will cover new and exciting outdoor adventures. 4. What do you think readers will love most about the new-look and feel of the magazine? Wild has been expanded to include 100 pages of outdoor adventure. About 60-70% of our content remains Australian, with 30-40% dedicated to international adventure. In addition to great stories of adventure and photos, Wild now also includes Track Notes, Adventure Travel Destinations, Gear and Buying Guides, as well as features on conservation and other environmental issues. 5. What are your top 3 WILD adventures in Australia? For me, the Australian Alps (stretching from NSW into Victoria) continues to be a fantastic location for adventure. During winter, you have everything from snow-shoeing, ski touring, ice climbing and who doesn’t want to wake in a test with virgin snow right outside. And in summer you have literally hundreds of kilometres of serious and easy hiking, mountain biking and all manner of adventures in between. Central and Western Australia provide opportunities to feel like you are the only person for thousands of kilometres around (which is probably true). But the landscape often looks completely alien for all us coastal dwellers. Finally, Tasmania is in its own complete environment on its own. We have Middle Earth right on our doorstep, without having to cross the ditch. And there are still areas in Tasmania that you can only reach by boat, plane or walk. 6. Your top 3 most beautiful WILD destinations in Australia? Difficult to go past Tropical North Queensland, with world heritage mountains, rainforest and reef. Northwest WA and the Kimberley region will have you feeling like you’ve stepped into another world. The colours are incredible. Many of the National Parks in the Northern Territory are pretty awesome, with the merging of the desert, lagoons, forest and a huge array of flora and fauna. 7. Your top 3 recommendations for a WILD adventure for families? Always start easy. The outdoors can be a little daunting and little scary for families. If hiking, start with a short hike (1-2 hours) and the build up. The same goes with paddling and other adventures. If everyone has a great experience the first time around, they are likely to want to go back. You might think it's fun to get out in the pouring rain, however, this is likely to turn the rest of the family off pretty quick. Don’t just pick the adventure you’d most like, but rather what the family will enjoy. Beaches, Rivers, Forests always offer lots of things to see and do and are generally accessible, even by car. Always remember safety first. Kids are more likely to get cold and hot faster than an adult. Hungry and tired kids are not going to be any fun for anyone. Always carry a first aid kit and PLB. You’ll likely never require either, but being able to respond to an emergency quickly is paramount. 8. And lastly, if you’re not experienced, what would you recommend is a good beginner destination and adventure in Australia? Many of Australia’s National Parks offer well-marked trails and hikes. These are graded from easy to advanced, and will generally recommend a hike time. Most capital cities also have a range of bushwalking and hiking clubs (especially on Facebook). These are a great way to join other like-minded adventures, who are generally more than happy to welcome new adventures. What 'me-time' means to editor Brendan James of Golf Australia magazine. ON THIS DAY.. planet Neptune was discovered!